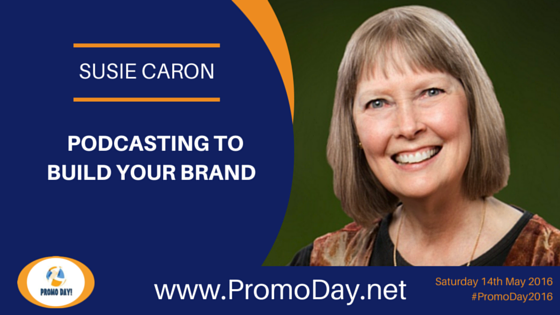 I'm happy to announce that Susie Caron will be presenting a webinar at the Promo Day 2016 event. Susie will be presenting "Podcasting to Build Your Brand" during this years event on Saturday 14th May. Susie Caron is a best-selling picture book author and a life-long student. She retired early from careers in teaching, psychotherapy and parent coaching to focus on her specialty - parent-child relationships. In addition to writing picture books, Susie writes a weekly parenting blog and produces the podcast “Building Parents & Good Kids.” She is currently writing a book for parents. Her life’s work with children and parents, provided Susie rich resources from which she gained wisdom and skills to share with today’s parents. Susie says, she loves to help parents connect with their kids, gain their cooperation and enjoy them more every day. Thinking about podcasting? Want to ramp up your brand? This webinar gives you both. Join Susie Caron as she unveils how easy it is to use podcasting to build a recognizable brand and help you stand out.